When I was younger, every year, my parents would take me and my siblings to a local pumpkin farm. Remember when I said I was kind of a fraidy-cat? Yeah, well, I am. Haunted Houses, and the concept of them, have always scared the living you-know-what out of me. Creepy masks… rubber spiders… fog machines… scary music… it all adds up to one frightening experience for a young girl, deathly afraid but extremely morbid and curious at the same time. I’ve never been afraid of some blood and guts and stuff, and when I was in the fourth grade, I became an adamant watcher of Forensic Files which regularly talks about real-life murders which obviously include blood and guts (until I became petrified that someone would kidnap me, so I hung wind-chimes in my windows to signal me should an attacker decide to scale my window and unexpectedly pop in). Still, I’d pay my $2 and give a creepy little shudder before entering the scary brown barn. I’d instantly be greeted with the overwhelming stench of fog machine fluid and my ears would be blasted with some scary Halloween favorites CD. I tried to remain calm, tried to talk myself into thinking (believing) all this was fake. Those scary clowns lurking to my right are fake. The rats speared with stakes are fake. That vampire in that coff–OH MY GOD DID HE JUST MOVE? YES HE FREAKING DID OH MY GOD. So I never went in again. Until I was much older, and my maturity could handle the twitching monsters inside. But now, they have “adult” haunted houses that are, I’m guessing, 34874673654674234972634x creepier than the pumpkin farm’s haunted house due to the fact that people in elaborate costumes CHASE YOU with props like knives and chainsaws and scary voices down dark and deserted hallways. Sorry, Jessie. You got me to watch scary movies with you, but I am NOT paying $10 to go into a live-action haunted house just to poop my pants when I could do that in the comfort of my own home WITHOUT some freaky Freddie Kruger lookalike chasing me down. I shudder at the thought, and even the concept of the overdose on fog machine inhalation has my brain spinning. Speaking of overdoses, today I decided to take a bike ride through my neighborhood, 1) because I knew I would be overdosing on sushi later, and 2) because it was FINALLY a nice day and why not take advantage? So I rode over to these beautiful mansions tucked inside a gated community I finagled my way into. The air literally smelled like candy corn. As if the groundskeepers installed scent machines in the trees, pumping out candy corn smells like nobody’s business to make the people passing through feel even more bad about their living situation. ^ Pretty much the conversation in my head as I rode through. 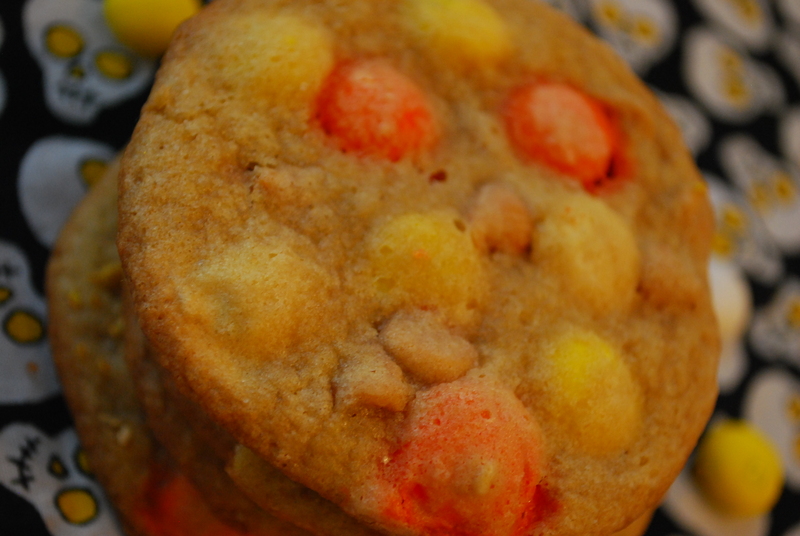 So I came home and made cookies chock-full of candy corn goodness. Except, they aren’t made with candy corn, but rather, candy corn flavored M&M’s. Yup, you heard me right. I spotted those puppies today at Walmart and fell in love with the novelty of such inventions. I knew they would have a special home inside of a buttery cookie, so that’s exactly where I put them. 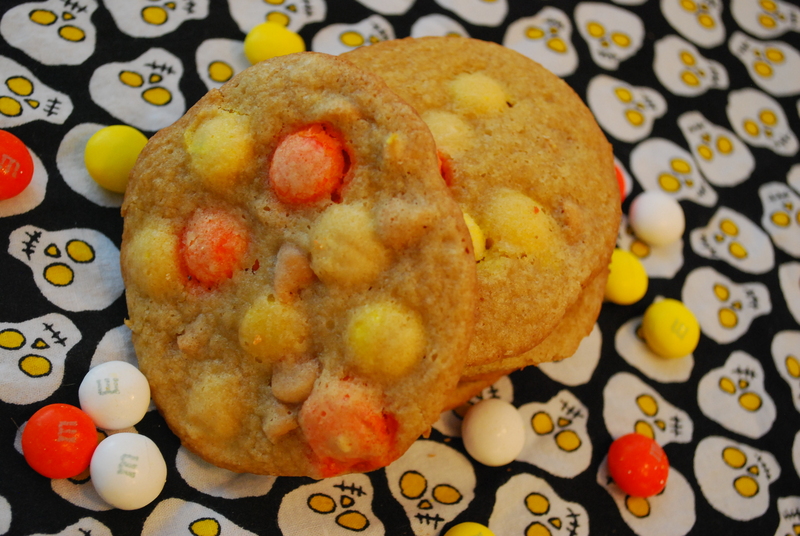 Welcome home, candy corn M&M’s. 1. Preheat oven to 325 degrees F. Lightly grease cookie sheets and pat excess off. 2. In a medium bowl, whisk together flour, baking soda and salt; set aside. In a larger bowl, beat together butter and sugars until creamy and well blended. Beat in the vanilla extract, the egg and the egg yolk until combined. Gradually mix in the flour mixture until combined into a dough. 3. Stir in M&M’s and butterscotch chips by hand (and if using oats, stir those in now, too). Drop cookie dough onto your greased sheets using a small cookie dough scoop about 2″ apart. 4. Bake 10-12 minutes or until light golden brown and set, rotating baking pans halfway through baking time if using more than one pan. Allow cookies to cool for about 5 minutes on baking sheets before transferring to baking racks to cool completely. Store airtight. **Wanna make this recipe easier? 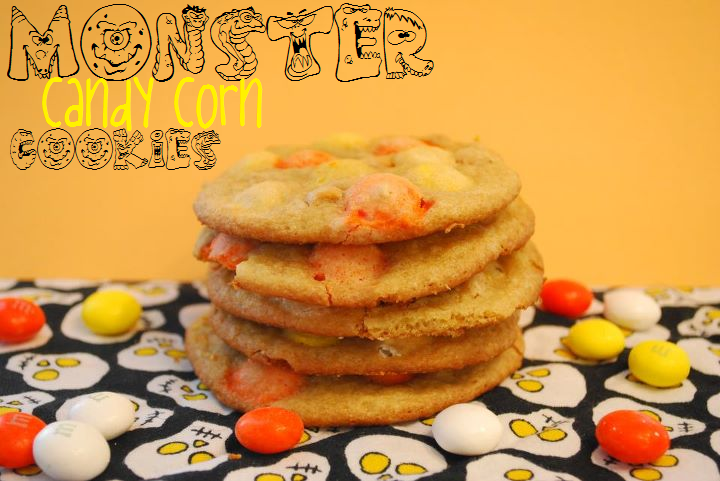 Use a package of oatmeal cookie mix, along with the ingredients on the back of the package, prepare as called for, and stir in your candy corn M&M’s and butterscotch chips at the end. Bake according to directions and enjoy–you not only saved time, but no one will know it was a pre-packaged oatmeal cookie dough! While those people may live in nice, humongous houses pumping candy corn smelly stuff throughout their neighborhood, I got the real deal baked inside a yummy, buttery cookie. Who’s the lucky one now?! And for the record, no amount of these cookies (although they’re delicious) could make me enter a scary haunted house. Nope, nada. Don’t even think about it. …Okay, well maybe if I had a hundred or something. But then I’d be the scary one.